Some Info that should help your HP ALFA make better performance! I built my first Alfa in 1966 and the EP Duetto in 1969. It was a struggle to find or build the right parts. Maybe some of this info can help you! The best performance improvement for the dollar! From many years of experience both racing and in building the close ratio gearboxes & transaxles, the lighter the clutch disk the easier it is for the transmission's synchronizers to function. Their large diameter & heavy weight causes the most inertia that the synchros have to slow down or speed up with EVERY SHIFT! By using a lightweight disk with no wafer springs or torque springs shifting is crisp & quick. For street & racing lighter fixed friction material disk can be built to suit your car & application. This is more effective than gear lightening at 3 times more costly not to mention a teardown. It goes without saying that reduction in flywheel weight is an important factor in getting your engines HP to the rear wheels. Alfa`s have always had too much flywheel and clutch weight. 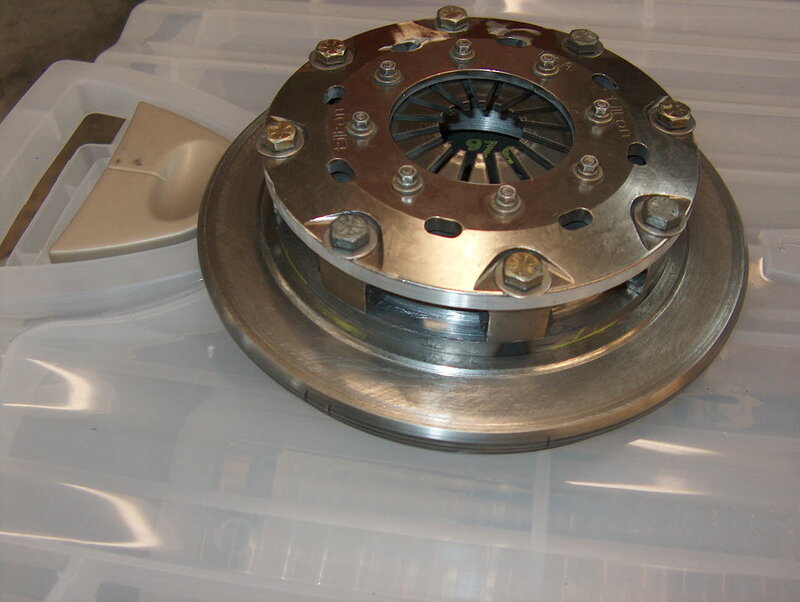 Stock Alfa flywheels can be modified for aftermarket Clutch assemblies which are far lighter. I`ll attach a few pictures of some modified ones for suggestions. Steel Plate 4 puck sintered metallic Durable, not the lightest due to puck material (sintered metalic) never use less than 4 puc as PP warping is a problem. More pucs reduce torque capacity. This is the ultimate flywheel & clutch application for 116 Transaxle race cars. The complete assembly including flywheel, clutch cover and clutch disk (Tilton triple disk) weigh under 8 pounds. flywheel with adaptor & Tilton single plate clutch assembly. Fits 105/110 tooth ring gears (1750). Assembly weighs less than 12 pounds. Clutch is rated at 250 LB ft Torque. These are grinds that have proven performance gains, that work as designed for ALFA motors. They have been built for me by Web Cams' (see Web Cams' link on the links page) for years. plays an important role in how the header affects the characteristics of the competition engine. camshaft due to faster flowing smaller intake and exhaust ports. The higher lift and longer mid & late lift duration provides much more HP & TORQUE! The Lobe spacing is critical on all 6 cyl. 12V cams, as is exhaust lobe shapes. (The 1.4 rocker ratio changes duration as well as lift) Over the last 11 years of building V6 race cams, I have spent the time to build the right cam for each application. RJR 961+6/82 Was developed as a track cam with ease of fitment as heads do not require modification. It is the highest lift possible without head mods and a stock base circle. These cams were originally designed as .375 lift cams to meet SCCA`s restricted prep rule when the GTV6 was allowed into ITS. With the .375 lift cams on a stock FI 2.5, well prepared motor, rear wheel HP increased from 165.8 to 185.3 at 5900 RPM, and torque from 138.6 to 158.6 at 5600 RPM. . The increased lift and duration was added to provide additional breathing for larger motors & higher RPMs. over 305 HP in the 13.5 to 1 motor consistently. Comparisons of popular Alfa Factory Cams1054800320051 and 1054800320001 these cams were applications by Alfa Romeo in the 1750 & early 2000 in Europe. The "51" cam has been relatively unknown in the US but several examples are known. It was a factory application in the 2 liter ROW cars. They are a factory marked cam and not a reproduction/regrind as some have suggested. Lobe shape indicates good application for F.I. cars because of shorter opening ramp than stock 105480320001, & early flank's duration carried into the nose, would suggest a good HP Street/Track Day application. Much better lobe shape than the "01" cam. Seating (lash) area is profiled at .014 to .022 from base circle. Seating (lash) area is profiled at .014 to .022 from base circle. Because of old ramp design suggest lash settings of .020 for the intake & .021 for the exhaust to reduce "wasted ramp duration" bleeding off effective use. Note: The "51" cam is a different profile from the 115010320032 cam everyone refers to as the GP 1 cam (10.9 lift 246 @ .050). These cams were around before those, and have a much better profile. The "32" cams were flat flanked cams that were "hammers", that would not make good HP Street / Track cams like the "51" cams. Statements from people who have driven the "51" cam confirm its excellent performance & drivability, unlike the "32" "GP1" cams which were very flat except at high RPM. Understandable as the "32`s" were designed as "lower performance " race cams. Alfa Romeo 10548 03200 51 Cam 10548 03200 01 Cam Data "115010320032 GP1"
These were designed to work in the Alfas' valve system to optimize intake & exhaust flow in my race & street/track motors. These cams all had their design based on the premise of HP and TORQUE to make a better performing engine for the street and or track. REMEMBER "Horsepower sells cars, TORQUE WINS RACES". A wider HP and Torque band makes a much better driving race car. Too much overlap will cause an extremely "peakey" or high RPM only motor. Cams can be used in either intake or exhaust position, not only the place I have suggested.. Just be aware these are good proven matchings. If you think you need more Intake or exhaust, help yourself! Be sure you have piston to valve clearance. There is no absolute regarding cam lobe centers for high performance Alfa 4 cylinder motors. RJR#51 a long duration all out racing cam for well prepared high compression racing engines. A 12mm lift cam with moderate ramp rate. Paired with the RJR cams below the power band can be tuned to a broader range than with paired cams of equal duration without loss of upper end performance. Power band 4000-8000 RPM. (DO NOT confuse this lobe design with the 1054800320051 cam!) RJR#125 and 796 are a fast ramp cam that works well as a racing exhaust for all out larger race motors. It would however as well be a good intake for a track cam for moderately well prepped motors. RJR#796 is covered below. RJR 221-776 matched Set of New RJR High Performance/Race Cams for Variable Intake Setup. Intake is 12.0mm lift with faster ramp and 1mm more lift than "International" design so more duration could be used with Spica or EFI and still be drivable. Exhaust is again a faster lift with less duration at low lift but more in the nose of the lobe where the valve is open higher and is breathing better. The Exhaust grind 776 would be an excellent exh. cam for larger displacement Race motors with longer duration Intake cams (like RJR136). RJR 590 Cam designed for Alfa 1600/1300 use as HP Street / Racing intake, or larger motor exhaust. Fast ramp, much more open valve duration than old style race cams, with less wasted duration (overlap) to bleed off power. Fast ramp & early flank make cam a good application for lots of Street/ Track Day / High Performance use where desire for low & mid range power in large displacement motors is wanted, as well as upper RPM punch. . This is a better version of the 105480320051 factory cam. An all around good performer. The correct way to lower without crapping the roll center! The most "drop" that can be done, is dependant "physically" by the clearance of the lower ball joint body in a 750/101 suspension, and the ball joints' threaded taper & nut on 105/115 and the 116 type cars. Optimally, the suspension would be designed so that with the lower arm level (key to suspension design), the rotational part of the ball joint would be barely clearing the designed rims' inner shell. (see pictures of the RJR GT-R on my website) However, doing this requires the rest of the suspension points be designed into the car so that geometry is functional. When working with compromised suspension designs on existing cars, only a limited amount of change is possible, or you have to go into pick-up point modifications (typically not legal). On the Alfas' you have to consider the distance between the pick-up points on the body for the upper & lower inner pivots. That is about 12 inches . 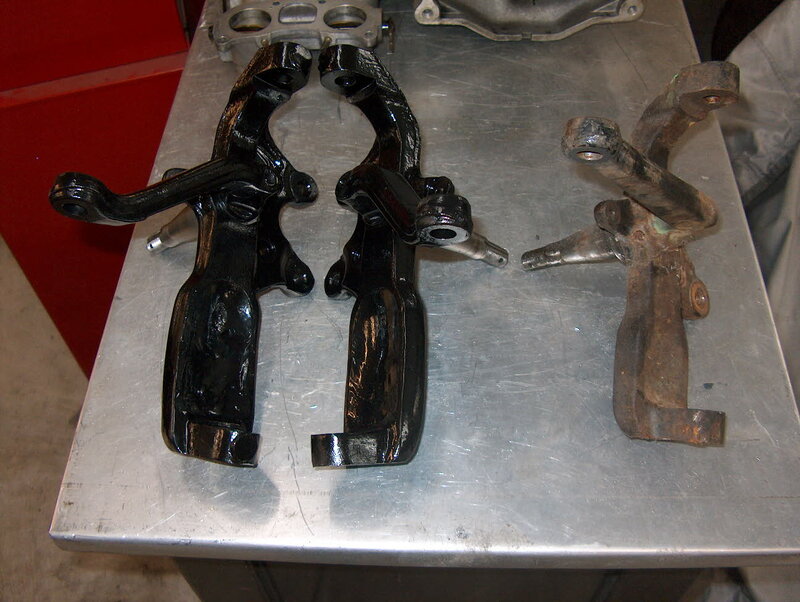 On the stock car the outer ball joints are almost exactly the same, relying on a shorter arm to give camber change (less than can be optimized for performance). By adding to the length of the upright (dropping the spindle) with the car situated with the lower arm level, the upper arm outer ball joint will be higher in relationship to its' inner pickup point. The result is a lower car, without a terrible roll center drop, with more camber change as the wheel moves up & down. This gives better compensation as the car rolls into a turn (moving negative on the outside wheel & positive on the inside wheel. Since the lower, longer arm is "level" it has less movement "in & out" than the upper which enhances the camber change, Even when the lower arm is not level the camber change is enhanced, but not as perfectly. The other consideration is body clearance which is also an issue, & that has to be accommodated. On my wide body 101 racecar the spindle drop is 1.5 inches. Typical drop is a 1 inch drop as they go on a lowered, stock fender vintage car. The steering arms are dropped to eliminate bump steer since most are lowered to get the arm level by shorter high rate springs. 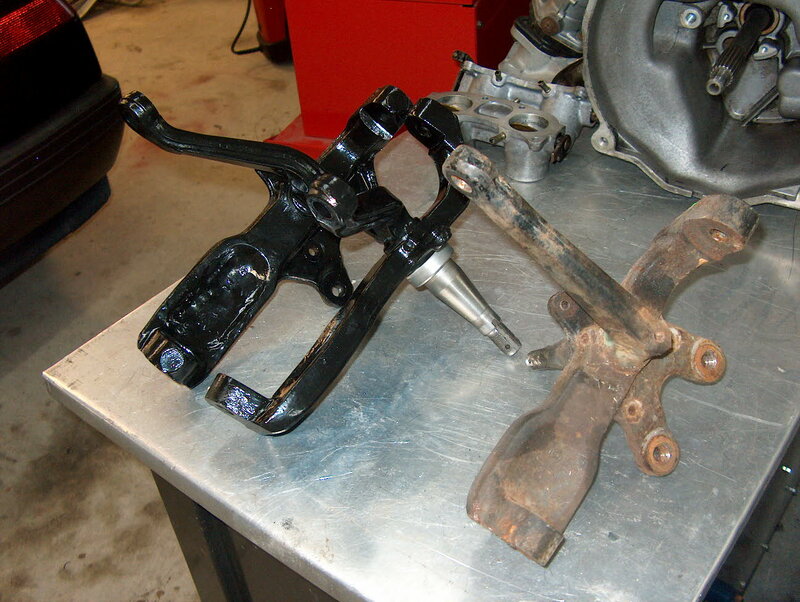 The amount of steering arm modification is dependant on the total drop of the car. The Ackerman is adjusted as well, so that the car does not need to be set with initial toe out to eliminate initial understeer. The toe can be set at "0" toe for less wear, AND better braking stability ( a big plus! ).